Gov. Nathan Deal today (Monday) appointed Rep. Chuck Williams director of the Georgia Forestry Commission, creating a second opening in Oconee County’s state legislative delegation. Williams represents the 119th District in the Georgia House of Representatives, which consists of 10 of Oconee County’s 13 precincts and parts of southeastern Clarke County. On Wednesday of last week, Gov. Deal appointed Rep. Regina Quick as Superior Court Judge of the Western Judicial Circuit, which includes Oconee County. Quick has represented the 117th District of the Georgia House of Representatives, which includes three northeastern Oconee County precincts as well as parts of Barrow, Jackson and Clarke counties. Georgia Secretary of State Brian Kemp is expected to call for special elections on Nov. 7 to fill the two seats in the House of Representatives. The only other elections likely to be on the ballot in Oconee County on Nov. 7 are in Watkinsville, where voters will select a mayor and two members of the Council. Only one of those three elections–for Council Post 2–is contested. Williams lives on forested land in Oconee County and has “a keen understanding of the forestry community in our state and country,” the news release quotes Deal as saying. Williams will replace Robert Farris, who became director of the Georgia Forestry Commission in August 2008 and who retired in May. The appointment is effective on Sept. 1, according to Deal’s statement. Nov. 7 is designated as the next possible date for a special election on the calendar of Kemp’s Secretary of State Election Division. Fran L. Davis, elections administrative assistant at the Oconee County Board of Elections and Registration, told me today that Sept. 1 is the last possible date for the local office to submit a ballot for that election. Davis also confirmed that only two candidates had filed for the two openings on the Bogart Council, only three candidates had filed for the three openings on the North High Shoals Council, and that only the incumbent mayor and four Council members had qualified in Bishop. Unless someone files to run as an official write-in candidate by the end of the week, those three cities will be able to declare the results final and won’t be required to hold an election on Nov. 7. Both Williams and Quick, who are Republicans, are the only persons elected in the existing 117th and 119th House districts. Williams was elected in late 2011 to fill an unexpired seat in the 113th House District, which included all of Oconee County. The legislature redrew the districts later that year, and Williams was elected in 2012 in the new 119th District. Quick was first elected in 2012 in the newly drawn 117th District, defeating Doug McKillip, who was elected in the old 115th District but ran to retain a seat in the new 117th. Even before Quick’s appointment to the judicial position, McKillip had announced that he would run again for the 117th House District spot. Houston Gaines also has announced he will seek the spot. Both McKillip and Gaines are Republicans. Deborah Gonzalez is running as a Democrat. In a special election, the candidates all run against each other, and a runoff is held between the two top candidates if no one gets a majority of vote in the first round. No one had come forward prior to the announcement today of Williams’ appointment to challenge Williams in 2018 in the 119th House District. The 117th was configured by the Republican-dominated General Assembly to give McKillip or another Republican an advantage. 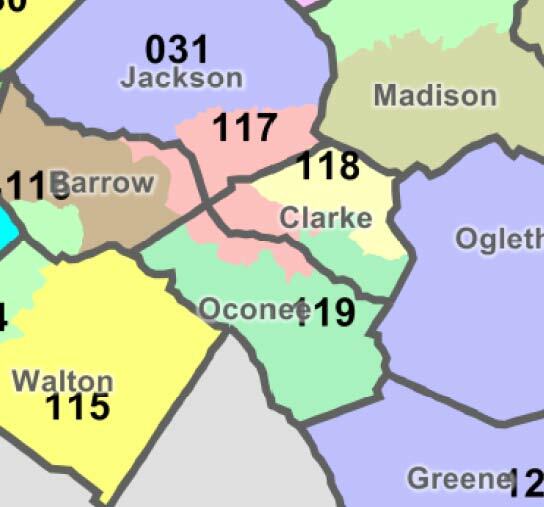 The contribution of historically Democratic Clarke County in the 115th District was reduced in the new 117th, and the Oconee County Precincts of Athens Academy, Malcom Bridge and Bogart were added, along with parts of Barrow and Jackson Counties. Based on June 1, 2017, data I downloaded from the Georgia Secretary of State web site, 9.5 percent of the registered voters in the 117th District are in Barrow County, 11.5 percent are in Jackson County, 23.6 percent are in Oconee County, and 55.4 percent are in Clarke County. Quick lives in Clarke County. 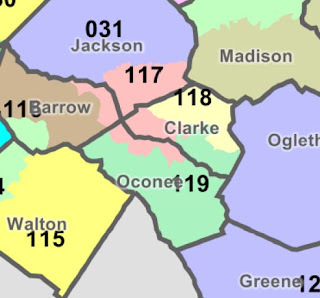 The Republican strength in the old 113th District was lessened in redistricting by inclusion of larger parts of Clarke County in the new 119th. Registration, based on the June 1, 2017, figures from the Georgia Secretary of State web site, was split with 49.0 percent from Clarke County and 51.0 percent from Oconee County. McKillip lives in Oconee County, but Gaines and Gonzalez live in Clarke County. Oconee County is in the 46th Senate District, represented by Bill Cowsert of Athens. It is at least possible that Oconee County could come out of the special elections on Nov. 7 without anyone living in the county representing the county in the General Assembly. 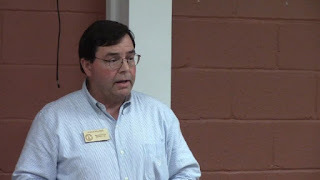 Dave Henry Shearon, 5 Hardin Hill Road, was the sole qualifier for the position of mayor of Watkinsville. Charles Ivie stepped down as mayor earlier this month for health reasons. Shearon is owner of Ashford Manor on Main Street in Watkinsville. Brian Brodrick, 117 South Main Street, qualified for Post 1, which he currently holds. Brodrick is a marketing communication specialist. Connie Massey, 2 Second Street, who had been serving as Post 2 Council member, qualified for that position. She lists her occupation as picture framer. Massey was sworn in as mayor earlier this month as a replacement for Ivie. Jennifer Gude, 1240 Stone Shoals Terrace, who lists her occupation as homemaker, also qualified for Post 2. Wade LaFontaine, 25 South Barnett Shoals Road, also qualified for Post 2. He lists his occupation on his notice of candidacy affidavit as senior assistant manager of undergraduate admissions at the University of Georgia. Watkinsville City Clerk Julie Sanders today told me that the names of Shearon and Brodrick as well as of Massey, Gude and LaFontaine will be on the ballot in November because the city has at least one contested election. The winner of the Post 2 contest must only get a plurality of votes, Sanders said. Bogart will have one new member of the Council at the first of the year. Current Council Member Michael Ward, whose term expires at the end of the year, chose not to qualify for re-election. Pam McNair, 156 North Church Street, qualified. Janet Jones, 140 West Thompson Street, an incumbent Council member qualified. Bogart does not have posts, and all candidates run at large. Part of Bogart is in Clarke County, but both McNair and Jones live in the Oconee County part of the city. All three incumbents in North High Shoals qualified for re-election. Ann Evans, 280 Hopping Road, qualified for Post 3. Violet Dawe, 300 Shadyfield Lane, qualified for Post 5. Mayor Johnny Pritchett as well as the four incumbent Council members qualified in Bishop. Pritchett lives at 4891 Macon Highway. Chuck Hadden, Council Post 1, lives at 1151 Townside Lake Court. Nedra Johnson, Council Post 2, lives at 5300 Price Mill Road. John Dekker, Council Post 3, lives at 4901 Macon Highway. Mindy Porterfield, Council Post 4, lives at 1880 Townside Lake Court. The Special Election is only two months and ten days or so away. 117 has had some lead time with three candidates so far in a mostly Democrat stronghold. An interesting campaign has shaped up. 119 will be quite the scramble. Generally a Republican stronghold, although little has been heard from the local Parties. Those who are organized and have some money will get out there first, with the clear advantage of name recognition. No names come to mind.